Starship Entertainment has unveiled three first members of their upcoming girl group, Cosmic Girls (Woo Joo Son Nyeo). The upcoming girl group is the first to debut under the label since SISTAR debuted in 2010. In addition to this, the group will include both Korean & Chinese members. The group is a joint project between Starship Entertainment and Chinese agency, Yuehua Entertainment. As you may remember, the previous collaboration between these parties resulted in UNIQ in 2014. Trainee EXY, known for her rapping skills from Unpretty Rapstar 2, will join the group. 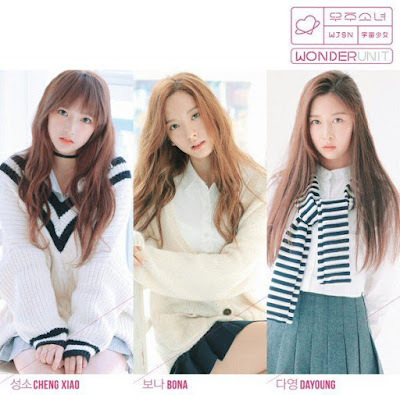 The "Wonder Unit" of Cosmic Girls include Cheng Xiao, Bona, and Dayoung.